It is encouraging to see that a new campaign is taking shape”to end U.S. and Canada sanctions against Venezuela,” writes Nino Pagliccia. August 8 (teleSUR) Venezuela has undergone many challenges in the last 20 years since Hugo Chavez was elected president and continued after his death in 2013. The main reason is that Venezuela has taken seriously the internationally recognized right to be sovereign and establish its own social model. Violence has never been part of the model. However, violence has been the reaction of those who do not want to change the status quo despite the people’s majority democratic electoral choice. The new social model chosen by Venezuela has been widely called the Bolivarian Revolution. It is a revolution that is still under construction. In fact, having defused the rampant right-wing violence, and with Nicolas Maduro as the re-elected president as of May 20, Venezuela continues building an unequivocal socialist anti-imperialist society by strengthening its Bolivarian Revolution. It is succeeding socially and politically by retaining considerable popular support, while it’s struggling economically because of foreign-induced hyperinflation, crippling sanctions and the U.S.-led financial blockade. On July 25, President Maduro announced a series of economic measures that many were expecting following the creation of the crypto currency, the Petro, in March. The most relevant announcement was that on August 20 Venezuela will put in circulation a new currency, the Sovereign Bolivar (Bolivar Soberano, BsS), that will reduce by five zeros the current value of the Strong Bolivar (Bolivar Fuerte, BsF). The referential value of the BsS will be linked to the Petro, whose value is pegged to the price of a barrel of oil. To give substance to this action, the state oil company PDVSA – with the largest oil reserves in the world – will transfer a large oil field in the Orinoco Belt, with almost 30,000 million barrels of oil, to the Venezuelan Central Bank. Undoubtedly, this sent shockwaves through the world monetary and financial system in what may be dubbed a ‘monetary revolution’ that signals the beginning of a possible trend to drop the U.S. dollar as a reference, and the expansion of the use of crypto currencies. Iran has already suggested it might take a similar path. Also, Russia and China are already building their gold reserves to back up their currency and they may welcome Venezuela’s move since they have economic interests in Venezuelan oil. It is still too soon to understand the full implications of this monetary revolution, also considering that we do not know the details of the monetary conversion. We do know its stated intentions, which are to stabilize the currency; stop capital flight, increase production and encourage international investment, all leading to economic recovery. We also know there was a pre-emptive reaction in March when the United States announced sanctions to forbid U.S. citizens and businesses from doing any transactions in Petros. Surely, we know the political reasons “Venezuela needs this change.” In a sentence, the United States is using all its power to produce another type of change in Venezuela – regime change – in order to have imperial control over it by creating economic havoc. Military threats such as the ones already used against Venezuela under the pretext of alleged humanitarian crisis can be quite a strong disincentive on the economy. However, even with its military might, U.S. imperialism could not survive or spread without the financial system that keeps track of global capital. If the military industrial complex, armies and banking institutions can be seen as the hardware of the U.S. imperial machine, the U.S.-based financial system is the software that operates the day-to-day operations of policing trade, competitors and governments to ensure the generation and protection of wealth for the empire through financial monopoly. The policing of all financial transactions by the United States was facilitated when the gold standard was dropped by the Nixon administration and the dollar became the new monetary standard. But we need to keep in mind that the dollar also has a psychological value based on the trust people put on it. We could say it’s largely a paper ‘crypto’ currency, whose value is manipulated by the U.S. financial system and enforced by military power. In fact, part of the policing process is punishing all those deemed to challenge any aspect of U.S. power. And that’s when sanctions and financial blockade come into the picture. The United States has used sanctions and financial blockade regularly as instruments of intervention. 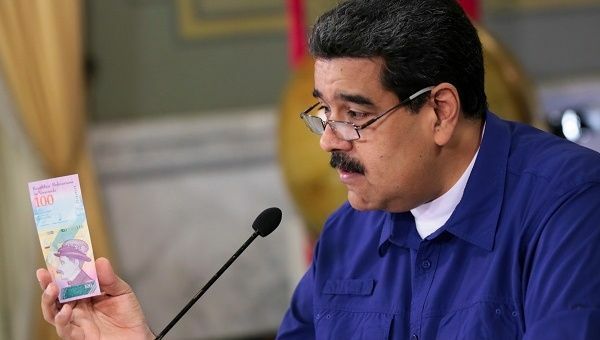 At the time of writing, a failed attempt on the life of President Nicolas Maduro was carried out on August 4 while he was delivering a speech to a gathering of the Bolivarian National Guard. Preliminary official information reports that the security forces immediately began investigations and that several of the material authors of the attack have been captured, together with part of the evidence of the attack. The effective initial investigation made it absolutely clear that this is a conspiracy against the life of the president, employing an act qualified as terrorism. The government of Venezuela is convinced that this attack desperately sought to stop the implementation of the new measures for economic recovery announced by the Maduro administration that are to be launched on August 20. These measures are meant to be effective responses to the country’s crisis that will bring stability, prosperity to all citizens and hopefully peace. The Maduro government is doing everything possible to tackle the foreign-induced economic crisis by announcing what can be called a ‘monetary revolution’ with a new currency linked to a crypto currency pegged to the price of oil, while at the same time preserving its ongoing revolution, the socialist Bolivarian Revolution. We do not know what the ultimate impact will be on the economy because there are too many factors involved. Some observers are skeptical about a positive impact and even call on the government to implement other economic measures that might include a compromise of its socialist principles. Others consider any compromise a myopic approach – no matter what the short-term intentions might be – that will play to the interests of the United States. We should not doubt for a moment that any attempt to liberalize the Venezuelan economy under the banner of Bolivarian Revolution will not be allowed to succeed, as more liberal policies are not allowed to succeed in Nicaragua under the banner of Sandinismo. The United States will never give up its goal of regime change. The almost 60-year-old blockade of Cuba is another point in case, despite the recent cautious introduction of ‘market economy’ elements in the country. Disillusioned Venezuelans and the international community of experts, analysts, observers and activists – indeed all who care about a sovereign Venezuela and a more just world community – should turn their gaze on and reject the real intentions of the United States as the world power, and vociferously call on other nations to a more radical rebellion of the oppressed. The rapid success of this rebellion lies on the strength of unity and solidarity. We do know the devastating impact of economic sanctions on the population, and stopping the human suffering needs to be the focus of our attention. It is encouraging to see that a new campaign is taking shape “to end U.S. and Canada sanctions against Venezuela.” An initial subscription to the campaign gathered dozens of signatures from the United States and Canada. This is precisely what Venezuela needs from the international community.